It may be the holiday season but NAMA continues with its foreclosure action. According to today’s edition of Iris Oifigiuil, on 21st August, 2012 NAMA had George Maloney of Baker Tilly Ryan Glennon appointed as receivers to South County Developments Limited, a Dublin-based developer owned by Colum Butler and a company called Bucart Limited, a company in which Ciaran Butler is a director and which is in turn 100% owned by Astrofel Properties Holdings. Brothers Ciaran and Colum Butler are best known for their operation of the Leisureplex chain which includes bowling alleys in Tallaght, Blanchardstown, Coolock and in Stillorgan in Dublin as well as one in Cork city centre, and have worked with other well-known developers like Bernard McNamara in the past. There is no suggestion that any company other than South County Developments Limited has been affected by the receiver appointment. Our National Asset Management Agency, NAMA isn’t a unique species at all, and has plenty of domestic and international competitors. Okay NAMA is an asset management company which has a fixed expiry date of 2020 and that is unusual, as is an asset management company that doesn’t purchase new assets and in these straitened times when there is a credit drought, NAMA is certainly unusual for having access to €25bn+ of state-guaranteed funding at less than 1% per annum. Nonetheless, NAMA’s main competitor by size in Ireland is probably Bank of Scotland (Ireland) and its asset manager, Certus. But NAMA’s closest competitor in terms of method of operation is IBRC, the company formed last year from the merger of Sean Fitzpatrick’s Anglo and Michael Fingleton’s INBS, because like NAMA, it has an imminent expiry date – which we learn today is, like NAMA, 2020 – it doesn’t acquire new assets and it is 100% owned, and funded by, the State. Today, it published its report and accounts for the six months ending 30th June, 2012. The news from IBRC is not good with a further €742m loss after tax and a loss after all recognised income/loss of €504m. IBRC’s equity is down to €2,734m, even after having received a €34.7bn bailout from the State. In other words, if there are another €2.7bn of losses incurred then we will be on the hook for further bailouts. And with the H1, 2012 results and a challenging immediate outlook for Irish property added to anaemic domestic economic growth, you would have to be anxious. What might transform anxiety to terror is the little item buried in Note 38 to the accounts at the veeeery end of the report. IBRC lost a court case in London’s High Court in July 2012 which means that it must repay a junior bondholder the sums haircut in a bond redemption. The case has been appealed by IBRC, but if IBRC loses the appeal, then it is likely to be exposed to claims that may be in the billions from other disgruntled junior bondholders whose bonds were subjected to haircuts. And so too, by the way, might AIB and Bank of Ireland. IBRC is also currently recognising nearly €900m for NAMA subordinated bonds which will only be honoured if NAMA makes a profit by 2020, and NAMA is at this stage forecasting a breakeven WITHOUT HONOURING THESE BONDS – in other words, NAMA doesn’t think it will make a profit which will allow these bonds to be redeemed and that is at odds with what IBRC thinks. IBRC’s CEO, Mike Aynsley and chairman, Alan Dukes have previously indicated that when IBRC is wound down, it may in fact return €4bn to the Exchequer on the basis of the cost of Anglo being €25bn compared with the €29.3bn bailout given to it (remember INBS received an additional €5.4bn, meaning IBRC in total has received €34.7bn). At this stage, not only would you have to be very sceptical about IBRC returning ANYTHING to the Exchequer when it is wound down, but you would have to be concerned that we will be called upon for further bailout funding. 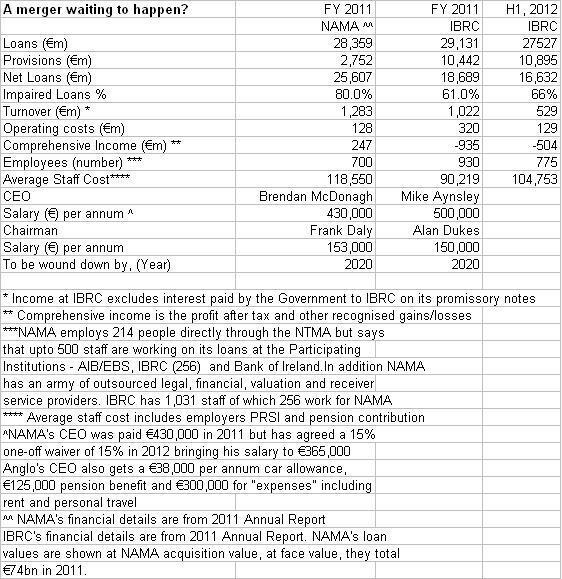 A subject examined on here before is the potential to merge NAMA and IBRC, and the comparative spreadsheet has been updated to show how similar these two organisations are. There are definite synergies in merging the two organisations, and we might see cost savings in NAMA if IBRC’s vaunted “cost management exercise” alluded to at the top of this blogpost were adopted in NAMA. It is probably one of a thousand synergies.